Pros – Very fast TtK with body shots (1.07s, 17 body shots to kill). High aim assist, mag size, and reload speed. For those of you who never managed to get a perfectly rolled Doctrine of Passing in year two, The Unbent Tree may be your shot at redemption. Like almost all auto rifles in the high-RoF archetype, it suffers from inherently poor stability, range, and recoil direction, but makes up for it with high aim assist and mag size, as well as one of the fastest body shot times-to-kill in the game. As for perk recommendations, just like with the DoP, if you can handle a higher zoom scope, you’re going to want to use it. In this case, the Iron Ranged Scope provides a boost to aim assist, as well as pushing back the start of damage fall off by a noticeable amount. 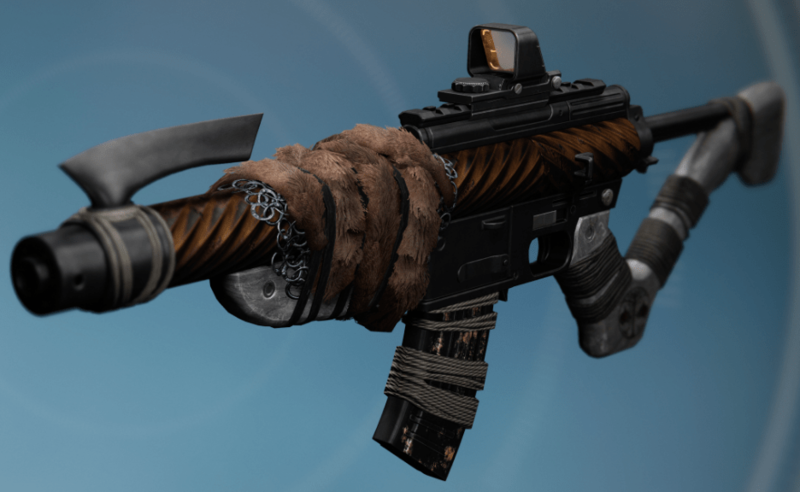 Braced Frame and Counterbalance is the god-roll combo you’re going to look for the help make the gun’s recoil as manageable as possible, but Perfect Balance and Smallbore can be passable secondary options if you weren’t lucky enough to get Braced Frame. Without Counterbalance, you’ll probably struggle to handle the weapon well enough to use in PvP, but Rangefinder or Persistence can be passable in the right hands. In the third column, none of the perk choices are make or break, but Lightweight or Single Point Sling are preferred to help increase either agility or movement speed when ADS. Pros – Above average stability. Very high reload speed, mag size, aim assist, and equip speed. Neutral – Average max range. Cons – Below average base range. The Proud Spire is a shotgun in the lowest impact archetype, similar to the old New Monarchy Burden of Proof, or the Titan exclusive Immobius. Although it won’t ever be a PvP meta weapon due to the lack of a high one-shot kill distance, this class still has its uses. In PvE, it’s sought after thanks to its ability to pump a lot of rounds into high armor enemies quickly, and it can be used very successfully when rapidly cleaning up multiple weaker targets at close range. The run-n-gun playstyle is also favored by some Guardians in more casual 6v6 modes of the Crucible, and is proving to be a formidable strategy for Supremacy. Moving on to perks, there are two main ways to spec this weapon for combat. The first is similar to almost all other shotgun recommended rolls, in that you do everything you can to maximize range. Linear Compensator, Reinforced or Rifled Barrel, and Rangefinder will help you do that on this weapon, and then Quickdraw or Snapshot will give you that fast ADS speed to make sure that you’re getting the tightest possible pellet spread as quickly as possible. Personally, I feel that this is the wrong way to try to use this weapon, as you’re working to improve on its weaknesses (which only makes them average) instead of playing to its strengths. Instead, what I recommend is diving headfirst into the run-n-gun playstyle. You’ll still want Linear Compensator in the first perk slot, but we’ll take Rifled Barrel in column two instead of Reinforced, because keeping the gun as easy to control as possible well be imperative for quickly moving between targets. In the third column, Lightweight is going to give you the extra agility you need to run and slide faster and farther than you thought possible, but Single Point Sling can also serve as a poor man’s substitute. In the last column, you’ll have four options that will help to make this weapon a very effective tool. Full Auto, Battle Runner, Crowd Control, and Life Support can all be incredibly useful when engaging more than one enemy in a short period of time, but which one you pick depends on what you like the most. Full Auto makes it easy to do massive damage to high armor targets like supered Guardians or major or ultra enemies, and it no longer makes the pellet spread significantly worse than a shotgun without it. Battle Runner stacks with Lightweight to give you a massive boost to running speed, and can help you close on a second or third target before they can react. Crowd Control gives you bonus damage for a few seconds after each kill, which has the added benefit of pushing out the one-hit kill distance. Life Support can keep you alive in situations where you really shouldn’t be, and is top tier perk in PvP and PvE. Other perks in this slot include Final Round, Performance Bonus, Replenish, and Army of One, but none of those will really push this gun to be the best it can be.